And veils the farm-house at the garden’s end. Another Winter storm today in Quimperland…with gusts of over 90 km/h, we are huddled inside by our radiant fireplace. We hope you have warmth and shelter and light on this shortest day of 2018 in the northern hemisphere, and happy first day of summer to our friends south of the equator! YES! Winter has arrived…wonder what is in store for all????????????????? A short day passed, a long night to come, then balance returns to the planet, astronomically speaking, and hopefully, in other ways as well! Oh, how much I love this day. Short, busy and ending with making our beast bough. A quick trip to the barn to wish our sheep and donkey health through the coming year followed by snuggling in the house with a large cup of hot chocolate and a slice of spiced apple pie. We hope you lovely Hitty ladies have a cozy time in front of your fire too. Thank you – we love this day too and are thankful that we are very much cosier than those caught outside in the howling gale!!! Thanks for making each day of the year a special one with your narratives. I trust that the house stays steady and the fire keeps you warm and comfy. You are welcome! The Hittys and the house are safe and comfortable, fortunately for us! Beautiful photo and poem. Thank you! You are welcome – the poem caught our eye, and distilled the raging storm into words…thank you Emerson! 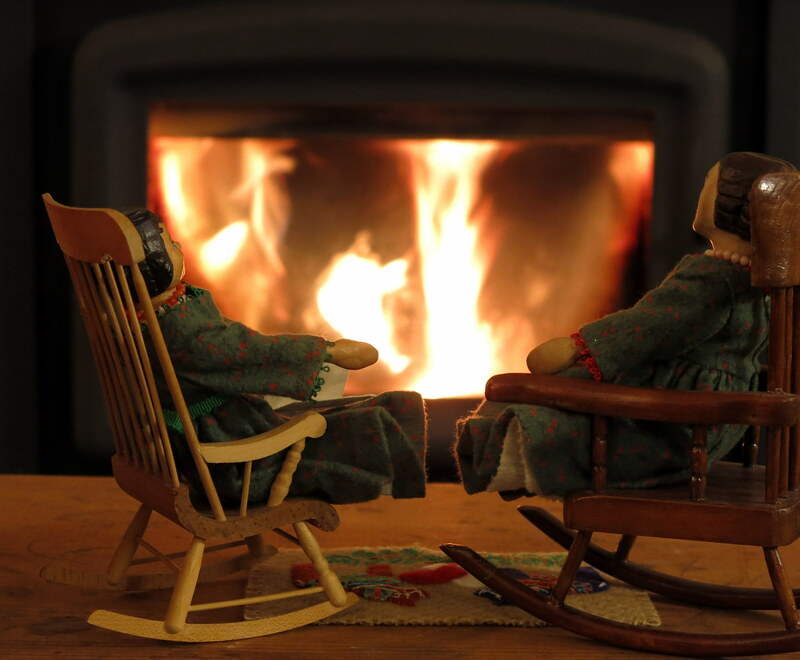 What a cozy scene..the girls in their warm flannel frocks and rocking chairs….and a fireplace! We are hoping for a mild winter . And the poem is one of my favorites. ..thank you. Goodness – what strange weather you are having…Santa is indeed welcome to spend as much time as he needs here recuperating by the fire! We even have some cookies, and eggnog with a little something added if he likes!